The goal of innovation is positive change, to make someone or something better. At Innovative Imaging & Services (IIS) we are commited to serving our customers, providing innovation in document mangement services. We take a unique approach by being your consultant –putting your needs first. Selecting your own Document Solution and implementing it is such a gamble if you are not really sure if it’s the right one for you. At IIS we enter your organization as knowledgeable and experienced consultants, uncovering ways to make your company more efficient and effective. We identify ways to reduce the costs associated with documents and point out costs you probably aren’t even aware of. 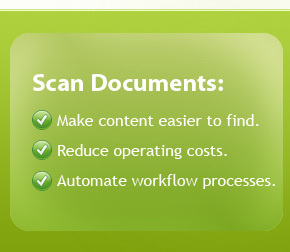 The benefits of having critical documents as digital files are significant and directly impact performance and profits. We are professionally equipped to manage your document scanning and imaging needs, we offer services that allow you to reduce your operating costs while gaining in efficiency. Typical service will include document scanning with automated or manual capturing of indexes, OCR/ICR, digital filing in a structured format to CD/DVD or existing Archival System/ Document Management Solution. Every customer’s requirements are unique. That’s why are always researching and selecting vendors that offer cutting-edge solutions for your document management needs. We can recommend document management and workflow services & solutions, or come up with a comprehensive custom-solution that can include services, equipment, software, system design and installation. Our imaging and document management professionals have the experience and resources to provide the best solution -tailored to your company, your industry and your specific project. © 2009 Innovative Imaging & Services. All rights reserved.